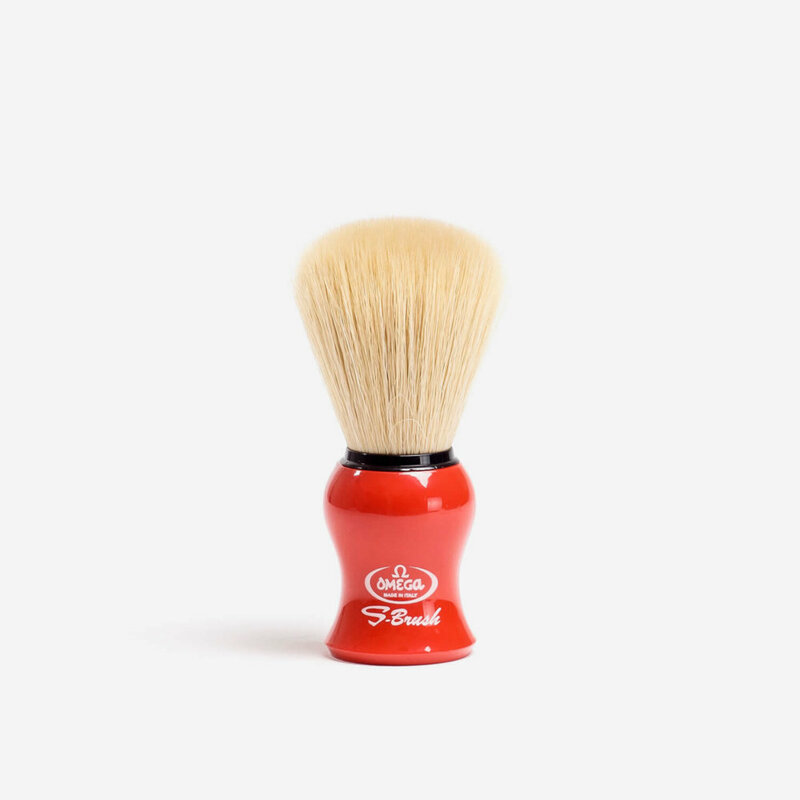 Synthetic fibre shaving brush with a red plastic handle. Part of Omega’s ‘S-Brush’ range. Excellent brush, lathers easily and well, dries quickly. Cracking brush and look at the price!! Fast and free delivery. The brush is high quality and I’m very happy with it. Great little brush. Well worth the money. Seems like a good brush… Just waiting for the first bristles to come loose ! I’m new to the traditional shaving. This is a lovely little brush at the price for a first foray. Dries nice and quickly too. Really nice brush, great value for money. This is one fabulous brush, I love it! My first brush was a Chinese badger which took ages to make lather with because it was so floppy. My second brush is a Kent Silvertex which has backbone on steroids, so it’s very easy to make lather with and to paint it on exactly where you want it, but has very little flex or springiness. I was taking part in an “All Italian” shaving month (hardware and software) and many of the pro-Italian guys were constantly raving about Omega boar brushes and their synthetic stablemates. So during a ShaveLounge browse I picked the Omega S10065 which I liked the look (and price) of. As soon as it arrived I was sorry I’d already shaved, it looked and felt so nice. The first shave was wonderful. It did everything I wanted it to. It has great backbone but flexes easily too. I usually do two passes, one WTG/Freestyle and one ATG/Freestyle. The flow-through of this brush gives me enough lather for probably four passes easily, whereas with the Kent I’d be reloading soap after the first pass. All in all this is one fantastic brush. For me it’s perfect. I gave my Chinese badger away some time ago, and I haven’t touched my Kent since the Omega landed. I could rave on forever but I’ll stop now. Please excuse me for rambling on… but you know what it’s like when you’re in love, you just can’t stop talking about it. Have tried many brushes from £20 upwards, however, this one beats ’em all, and no stray bristles in the soap, you know it makes sense. I purchased the blue version which is the same apart from the colour. Excellent brush for shave creams. Great build no bristle loss and a steal at his price. Usual excellent service from Shave Lounge. Great brush and cheap as chips. This is my least expensive brush and possibly my favourite.